KUALA LUMPUR (May 19): Auto sales dropped in April, after the pre-GST promotion offers that boosted demand in the preceding month. 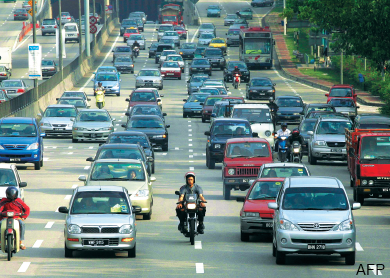 Malaysian Automotive Association (MAA) announced the total vehicle sales in April fell 23% year-on-year to 45,187 units, from 58,741 units in the previous corresponding period. On a month-to-month basis, total vehicle sales in April — which comprised of passenger and commercial vehicles — had dropped 33%, from 67,314 units in March. In a media release today, MAA blamed the sharp drop to consumers’ adjustment to the recent implementation of the goods and services tax. “The very high total industry volume in March was an abnormal month, due to consumers buying forward, prior to the implementation of the GST,” MAA said in a statement. For the four cumulative months ended April 30, 2015, MAA said total vehicle sales slipped 2.36% to 213,493 units, from 218,654 units in the same period last year. Despite falling sales, MAA said total vehicle production in April stood at 61,634 units — a 7% increase from 57,586 units in April last year and a 2.58% increase from 60,085 units in March. Year-to-date, MAA said total production rose 6.7% to 225,331 units, from 211,151 units in the same period last year. Going forward, MAA said sales volume in May is expected to be “slightly better” than in April, while noting consumers are cautiously optimistic as they adjust to the GST regime. In January, MAA said it expects total vehicle sales this year to grow moderately by 2% to 680,000 units, from 666,465 units last year.